Anencephaly is one of the most common neural tube defects. Neural tube defects are birth defects that affect the tissue that becomes the spinal cord and brain. The exact number of cases of anencephaly is unknown, because many of these pregnancies result in miscarriage. Having one infant with this condition increases the risk of having another child with neural tube defects. 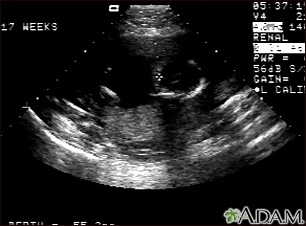 An ultrasound during pregnancy is done to confirm the diagnosis. The ultrasound may reveal too much fluid in the uterus. This condition is called polyhydramnios. There is no current treatment. Talk to your health care provider about care decisions. This condition most often causes death within a few days after birth. A provider usually detects this condition during routine prenatal testing and ultrasound. Otherwise, it is recognized at birth. Getting enough folic acid can cut the chance of neural tube defects in half.